The Hang It! For Breast Cancer Research project is really catching on. Our sincere thanks to Brewer for putting it in their newsletter. We can't wait to hear the success stories from the participating shops. Recently spent time bouncing around creative ideas with ladies who were attending a Hang It! demo. 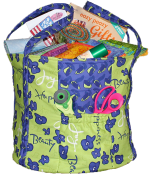 Some really fun ideas were offered and everyone left excited and ready to jump into the two hour sewing project that is raising money for a good cause. There is still time if you want your shop to take part. Read all about Hang It! For Breast Cancer Research on our home page at Eazy Peazy Quilts. The thought stuck me, Christmas will be here SOON. 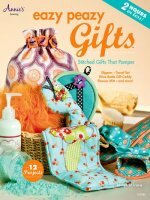 As your customers prepare for the gift-making-season remind them of the fun, practical and easy to make projects in our latest book Eazy Peazy Gifts. It was such a thrill to be invited! My sister, Marie Darrow, joined me to meet and greet shop owners and talk about Eazy Peazy patterns. Here is a link to the Checker Newsletter with lots more information. Hope to see you in Houston this fall. 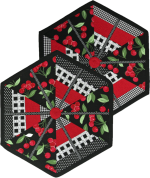 We will be there with new patterns including the Everthing But The Kitchen Sink Tote, the Piece O' Pie Placemats and a yet to be announced pattern for the kitchen. Also be sure to sign up for my Schoolhouse Session on Thursday when I will introduce great new products from Bosal Foam & Fiber.